NO, YOU READ correctly. 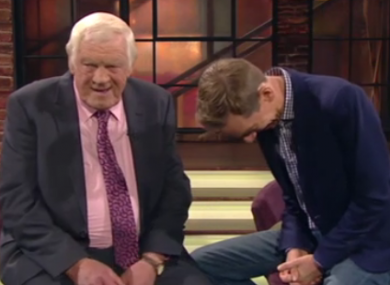 Last night’s Late Late Show was a country special, and it was something to behold. The likes of Nathan Carter, Declan Nerney, Big Tom and Daniel O’Donnell all popped along to give the audience a country bonanza. A man wearing jeans is nothing new, but Tubridy, a man we’re now used to seeing in a well-tailored suit, tried to pull them off last night. It was a bit like seeing your teacher out of school… unnatural. #latelateshow what the hell is Tubs wearing...jeans not suiting him tonight...maybe darker colour would suit!! When we say people were excited for Big Tom, we mean it. She did WHAT? The young country singer accidentally said Philomena did a lot more for him than inspire. Ohh er, get your mind out the gutter. Lisa McHugh, Nathan Carter, Declan Nerney, Trudy Lawlor, and many more all sang Wagon Wheel and the audience completely lost the run of themselves. Altogether now heeeeeeey, mama rock meee. Wee Daniel performed with Nathan Carter, and likened Strictly to literally experiencing death. Pleasant. He also revealed that he had never heard of Whatsapp! before Strictly. What? The Carlow-born Oscar nominee took no hesitation in throwing on a cowboy hat before she was shafted off to make room for the bonanza. FAIR. PLAY. Email “7 things we learned from last night's Late Late country bonanza”. Feedback on “7 things we learned from last night's Late Late country bonanza”.